The "Asura" of the title refers to a Hindu goddess whose beautiful face belies her tempestuous nature. In the film, the first Asura-like character we meet is the excitable Takiko (Eri Fukatsu), the third daughter of the Takezawa clan, who calls her three sisters together for an emergency meeting. Her big news: Their father (Tatsuya Nakadai) is seeing another woman, whose 10-year-old son may be his love child. 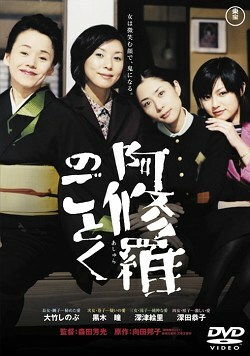 The other sisters are skeptical -- until Takiko produces photos taken by a gormless private investigator she has hired. With the proof in front of them, they vow to never tell their saint of a mother (Kaoru Yachikusa).